Marie Kondo’s 2014 influential book, The Life-Changing Magic of Tidying Up, inspired the presenters in this upcoming webinar. 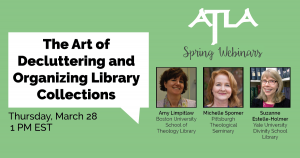 The panelists will discuss how “tidying up” parts of their collections, while in some ways a daunting process, is nevertheless a worthwhile and important endeavor for libraries. Issues addressed by the three panelists will include both the why and the how of collection development for particular resources and circumstances. Why is it important to undertake these kinds of projects? What are the advantages that will accrue to the library that does this–and what are the costs of not doing so? How do we even start? What kinds of decisions will we need to make and what are some of the factors that should be considered? Each panelist will relate their own experience in “tidying up” parts of their collections, specifically reference works, periodical subscriptions, and standing orders, and will offer guidance to others who are considering undertaking similar endeavors. Join us on Thursday, March 28 at 1 pm EST for this neat webinar. It will be led by Suzanne Estelle-Holmer, Associate Director for Research, Collections and Access, Yale University Divinity School Library; Amy Limpitlaw, Head Librarian, Boston University School of Theology Library; and Michelle Spomer, Donald G. Miller Librarian and Director of the Clifford E. Barbour Library, Pittsburgh Theological Seminary.